Well, so for Web Design 2 project I will redesign the website for Mobil. First I will find out about their competitor and analyze their advantage and disadvantage. The three competitors are Petronas, Shell, and Caltex. Petronas is a local oil company in Malaysia. The target audience are families and they shows support to families by being a sponsor for family education. They also stabilize their image as a leading local oil company that care about local audience. The advantage of Petronas is their status as a local oil company that owned by government. Automatically they get more advantages than other oil company in Malaysia. Beside that they also will be trusted more by locals. The disadvantage is their product range, Mobil have more product range than Petronas. 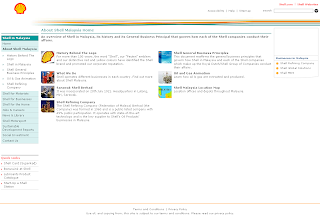 For the website, Petronas website using simple 2 framed website. Even though the navigation is quite clear, but the title for each navigation link is quite confusing, for example the "People" page. I think the title can make user confuse, what is the "people" here means? 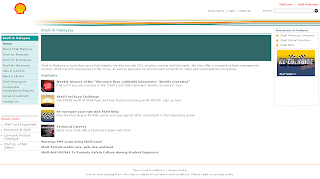 The content for that page actually about career opportunity in Petronas. Their sitemap instead of guiding people in viewing their website, they make user even more confuse by using thumbnails without any description on it. The link list also very brief and don't give user any information about the actual site map. The design is still acceptable, but needs more work on user-friendliness. Shell is the United States-based affiliate of Royal Dutch Shell, a multinational oil company of Anglo Dutch origins, which is amongst the largest oil companies in the world. Their target audience are younger people like teenager to working adult. We can see how they try to attract more younger costumer by having an online game about Shell oil in their website. The advantage of Shell company is they have more petrol station than Mobil in Malaysia, their petrol station are easier to find or accessed. They also have campaign about environmental friendly oil that attract many people especially environmentalist. The disadvantage is Shell has less product range compared to Mobil. While mobil has many types of lubricant, shell only has few types of it. Shell website using simple 2 part where the left is for navigation and right for content. 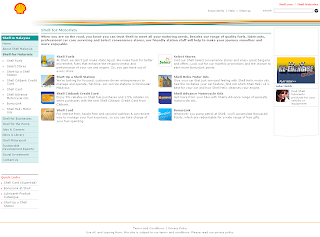 Their website also quite consistent, with same header, footer, and navigation for each page. Overall the design is simple and nice enough, but the website still feels boring even though there's online game as highlight. Caltex is a petroleum brand name of Chevron Corporation, used in more than 60 countries in the Asia Pacific region, the Middle East, and southern Africa. The target audience for Caltex are more to adult and working adult. They potray more formal and professional but still friendly service in their website. The advantage are the bonus that costumer receive when they buy fuel from Caltex. It will make costumer keep going to Caltex for fuels. The disadvantage is that Caltex less renowed that Mobil.